I was introduced to Marvell's "plug computer", and the Plug Computing Initiative, at last night's meeting of the Santa Clara Valley IEEE Consumer Electronics Society. Dr. Simon Milner, VP and General Manager of Marvel's Enterprise Business Unit gave an interesting (and entertaining) presentation. So, if you're like me, you're probably asking "what the heck is a plug computer"? I will give you my impressions here, but you can also listen to the narrated slideshow at www.plugcomputer.org. That sounds like Dr. Milner doing the narration. 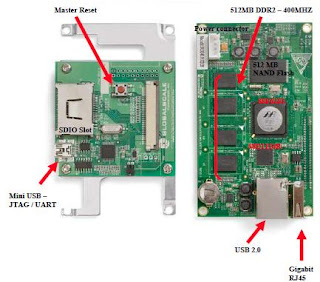 The plug computer is, as its name suggests (and as you can see from the pictures above), a fully functional computer with CPU, memory, and I/O - all contained within a form factor roughly the size of your typical (and unfortunately ubiquitous) power supply module. The processor is a customized ARM architecture. There are .5GB of RAM, and another .5GB of Flash, along with USB 2.0 and Ethernet ports. 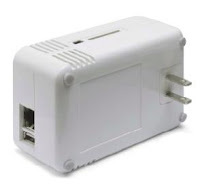 No on/off switch, just plug it in to your WiFI router and you've got a networked computer. OK, but what would I do with such a thing (I asked myself)? Well, the first targeted application is to easily enable management of digital media on network attached-storage. So, add an external USB hard drive. Imagine accessing all your files and media at home from any laptop or desktop computer, anywhere in the world, or sharing this content with friends and family without having to upload. There's even an iPhone application so you can always "phone home" to get your files! Hopefully, now you have some ideas for how this device would be used. I can see it stimulating other entrepreneurs to develop other applications. Here is a summary of my thoughts, pro & con. Easier than using your home PC as a media server. The whole world isn't as techie as silicon valley... it's still another box (or 2). Currently must be placed near your WiFI router. Built-in WiFI is in development, and Dr. Milner also mentioned some companies interested in a WiMAX application. As IEEE SV CES Chair Bill Orner noted, looking at something like the plug computer, it is amazing how far cheap computing power has come. I still think that for most consumers, managing a home wireless LAN is beyond their capability. However, once setup, it appears that adding devices like this to a network may be pretty painless. I could see a plug computer + storage, possibly Flash rather than HDD, built into some consumer electronics. We already see WiFI enabled devices like Blu-Ray players, and some new flat-panel TV sets.